Dry whole wheat muffins or bread and put through fine food chopper. To one cup of the crumbs, add one cup of brown sugar, one quart of thin cream, two teaspoons vanilla, few grains salt and a quarter cup of coconut or nuts ground with the crumbs. Freeze. As odd as this recipe sounds to modern American palates, it dates back to Victorian England and has a strong following in modern Ireland where it is best known as brown bread ice cream. The question is, how did it come to Fremont County in 1929? Mrs. Ethel Cleworth Twidale was born in England in 1880. She married Joseph W. Twidale on March 12, 1910 in Manchester, England. Their honeymoon must have been their voyage to the US, because they arrived New York City in April and were in West Casper, Natrona County, Wyoming, just in time to be enumerated in the Federal census on May 12-14. Born in 1877, Joseph was the 2nd son of a farmer with 8 other children. Ethel interesting is listed as a “spinster” on her marriage record. She was 30 years old at the time. The couple followed Joseph’s younger brothers Samuel and Frank who came to America in 1905 and settled in Natrona County. In 1915, the couple became US citizens and in 1916, they proved up on their homestead just across the Fremont-Natrona County line from Lysite. The family agreed to allow the State Forestry Extension Agent to use their newly built log home to demonstrate ranch beautification. 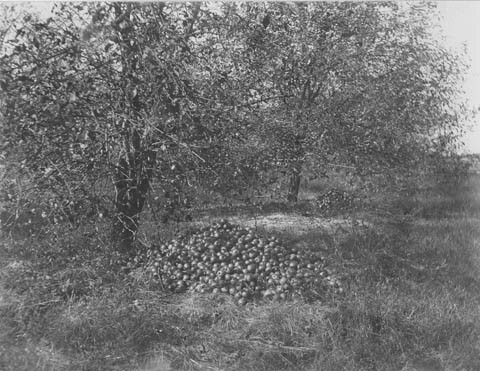 A plan for the planting of trees, bushes, flowers and a clover lawn were included in the Fremont County Extension Agent’s 1929 annual report. Later in life, the couple moved to Billing and lived on Wyoming Avenue. Joseph died in early 1954 and Ethel in 1959. Both are buried in Billings. It was a big job keeping the inmates at Wyoming’s institutions fed during the lean years of the Great Depression. Nearly every state institution had a farm operation in the 1930s. This allowed them to be nearly self-sufficient. Some even turned a profit on the food and forage they produced. They used the cheap and abundant inmate labor to reduce production costs. The symbiosis benefited the inmates by teaching them a trade and building their confidence and sense of responsibility. 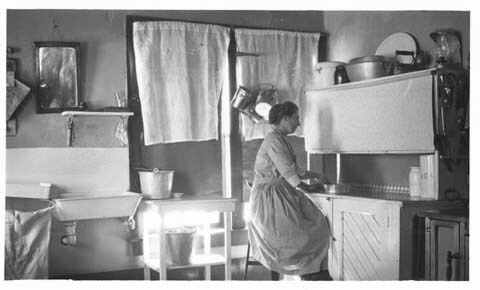 These photos and accompanying information come from a state institutional survey photo album complied by the state in 1932. Several copies are on file in the Wyoming State Archives collection. The Wyoming State Hospital in Evanston was the crown jewel of the productive institutions during the early 1930s. 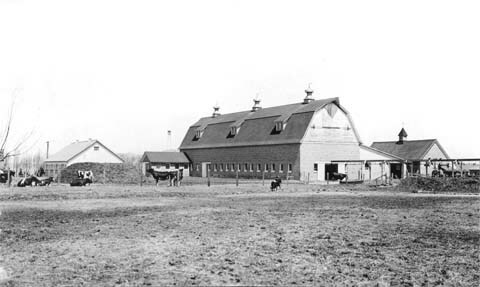 In an effort to provide affordable, quality food for the institution, a dairy herd was established in 1922. By 1930, this herd of registered Holstein cattle had grown to 41 cows whose anticipated production for the year would top 600,000 pounds of milk (approximately 75,000 gallons.) Not only did this supply the hospital with its entire dairy needs, it provided an income from the sale of surplus dairy goods and animals, which helped to defer other costs. The herd was regarded as one of the best in the Inter-mountain region. One of thier prize bulls was loaned to the University of Wyoming’s Stock Farm at Afton to help improve its Holstein herd. 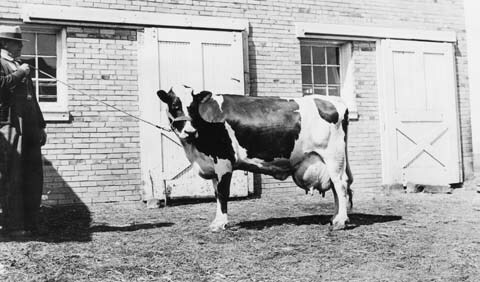 This 5-year-old Holstein cow in the State Hospital herd was named 1930 Champion C Class Producer of the United States. That year she produced nearly 12 gallons of milk per day! 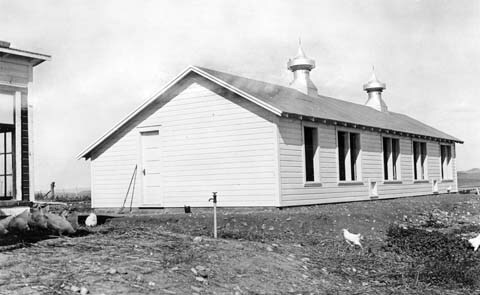 In addition to the cattle herd, the State Hospital also kept a large flock of chickens to provide all of the eggs and meat served at the hospital. 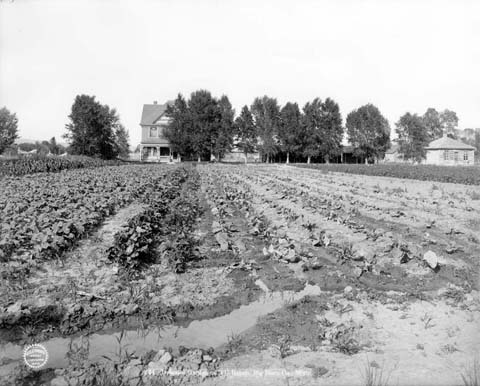 A large garden plot behind the superintendent’s residence supplied all of the vegetables used by the institution. 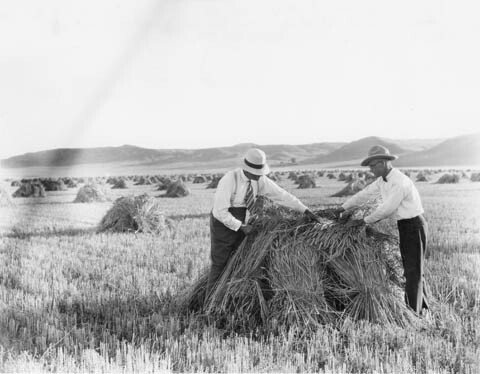 The grain and hay fed to the animals was produced on the 550 acre farm purchased in 1919. 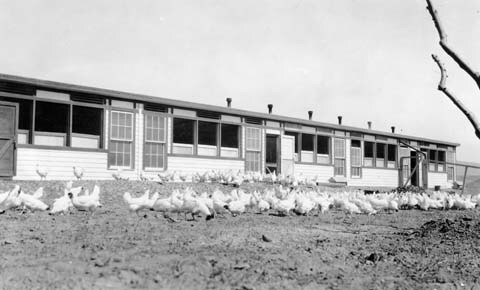 Flock of White Leghorn chickens in front of Chicken house at the Wyoming State Hospital in 1931. The chicken house behind them was constructed in 1930 to house 1,200 to 1,400 chickens. All was not roses, though. The pigpens were unfortunately located directly behind the main building. The hospital secured $3,000 in 1931 from the State Legislature to construct new pens and move the swine down wind from the buildings to cut down on the odor permeating the site. 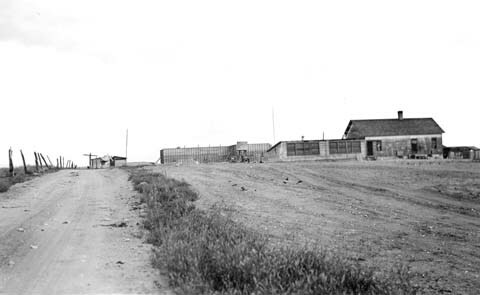 Pig pens at Wyoming State Hospital in 1931. They were to be moved farther away (and up wind) from the main buildings in 1932 because of the stench. 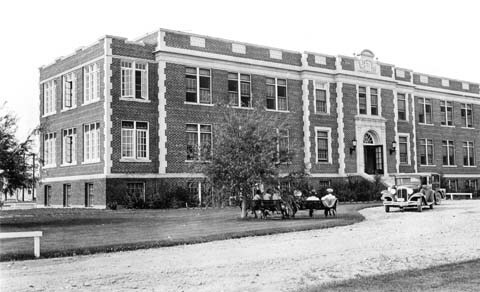 The Industrial Institute (now called the Boy’s School) in Worland also maintained a productive and lucrative farming operation manned by inmates and was a model of institutional self-sufficiency. The mainstay of the Industrial Institute was its Hereford cattle feed operation. Cattle were purchased on the open market and then fattened for sale in their lots. The institution made a concerted effort to not compete with local farmers in the marketplace. A dairy herd, flock of sheep, hogs, and chickens rounded out the livestock operation at the institution. 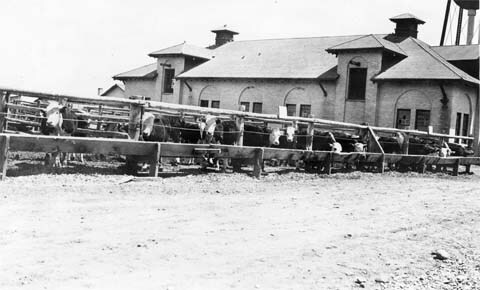 Cattle feeding pens at the Wyoming Industrial Institute (now Boys’ School) in 1931. These Hereford steers were fattened at the Institute then sold. Feed lot operation and livestock management was seen as a business/occupational skill for the boys. 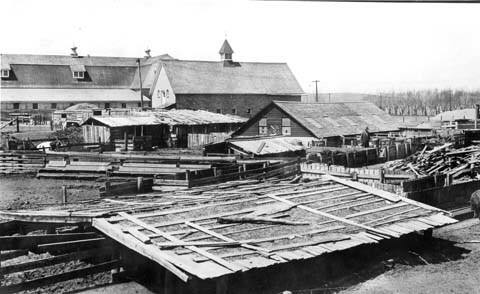 Extensive gardens and large fields of sugar beets for livestock forage were also planted and the boys were employed in a small, on-site cannery where they preserved the bounty for use over the winter. This institution in particular saw their farm and livestock operations as tools to teach their wards, boys ages 16-25, life skills and a useful trade. Back of Main Old Building showing attendant’s garden, Wyoming Industrial Institute, 1931. That year, the institution was able to raise nearly all of the food for their wards and sold the surplus for a staggering $86,700. All told, sale from the excess products equaled $86,700 for the 1928-1930 biennium, more than $1.1 million dollars today! In fact it was so productive that little more than building funds and partial wages were needed from the State budget to run the entire institution by 1930, amounting to just $54,150 that year. If you account for inflation, that would be approximately $700,000 today. The Girl’s Industrial Institute (now called the Girl’s School) in Sheridan, was a newcomer to the State, having been establish in 1920. Still, by 1931 almost all of the dairy, chicken and eggs, and many of the vegetables consumed by the 50 girls residing there were produced on site. Much of the hay and grain for the livestock was also raised on site. Like the Boy’s School, the Girl’s School used inmate labor to not only keep costs low but to provide instruction. Even the Sheridan County Fish Hatchery boasted a large vegetable garden and pasture. 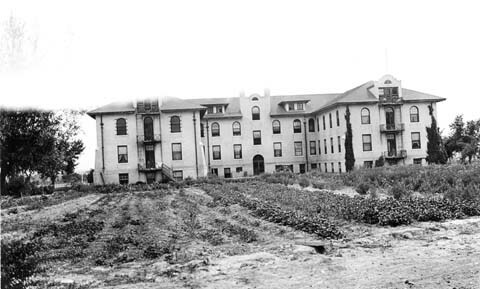 The State Tuberculosis Sanitarium (now the State Retirement Home) in Basin used its crops in a slightly different way. Because their wards were usually unable to work outdoors due to their respiratory condition, they did not have the cheap, abundant labor like the other institutions. No livestock was kept on site as they would have aggravated the delicate systems of the patients. Still, they planted acres of alfalfa and long rows of trees to keep the dust down for their patients. What about the Wyoming Honor Farm outside of Riverton? 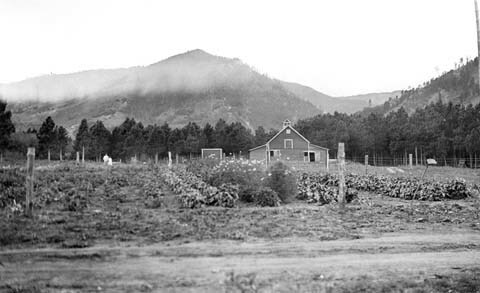 Originally called the Penitentiary Farm, the 880-acre parcel was purchased by the Legislature in late spring 1931 and did not become fully functional for a couple of years. The original buildings were little more than shacks and inadequate for occupation, much less security. Most of 1931 was given to building a dormitory and an adequate water system, both completed with inmate labor from the State Penitentiary in Rawlins. They did manage to harvest 40 acres of sugar beets, their only product that first year, with plans to greatly increase production in the following years. This time of year, it seems like summer will never come. How about a little sunshine on a plate to brighten up the day for today’s Friday Foodie? 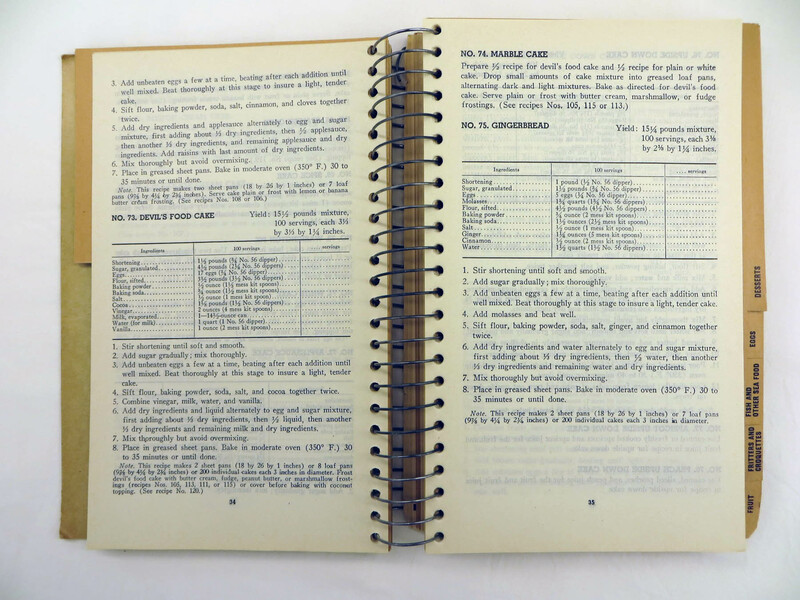 Elizabeth M. Stone of Evanston, Wyoming, contributed her recipe for sunshine to the Presbyterian Aid Society’s Evanston Cook Book of Tested Recipes. It was included in their 1914 “revised, enlarged and improved” second edition. It is unclear why Mrs. Stone called this cherry jam “sunshine” but it sure sounds like it would taste like a bit of summer on a dreary day. Boil sugar in a little water until it threads, add the pitted cherries, not using the juice from the pitting, and boil until clear, then add currant juice and boil until it jells. Citrus fruit is in season, so how about a recipe to use it! 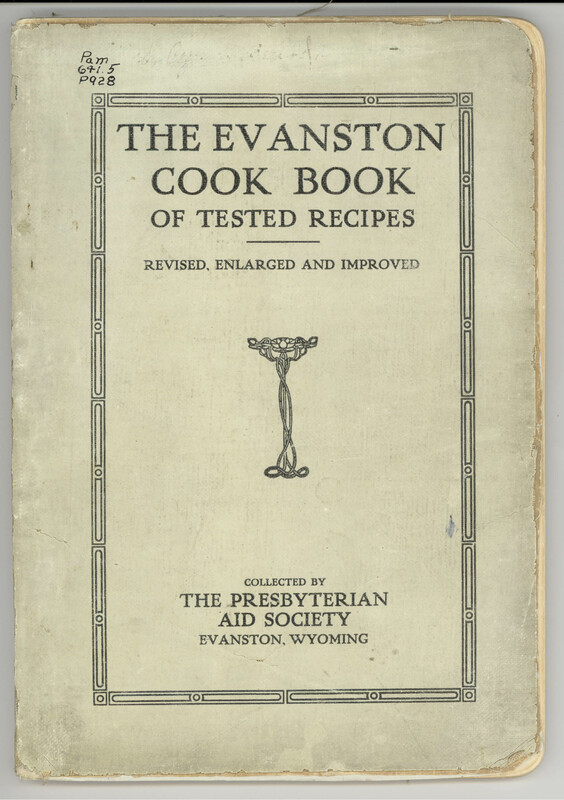 Today’s Friday Foodie recipe comes from Ida D. Foote by way of The Evanston Cook Book of Tested Recipes collected by the Presbyterian Aid Society in Evanston, Wyoming, in 1914. 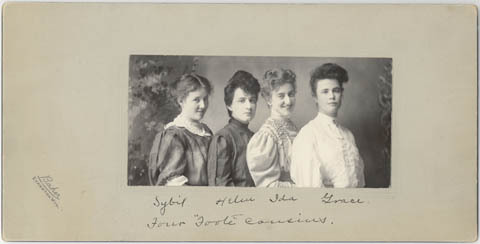 The four ‘Foote’ cousins – Sybil, Helen, Ida, Grace, photo by Charles S. Baker, ca 1915. Ida D. Foote was the daughter of Mark W. and Rose M. Foote. 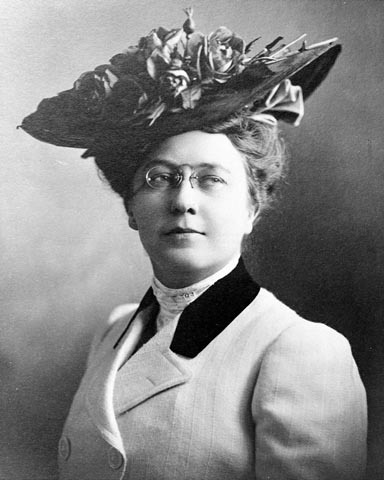 She was born in Indiana in 1878, the oldest and only girl of their four children. 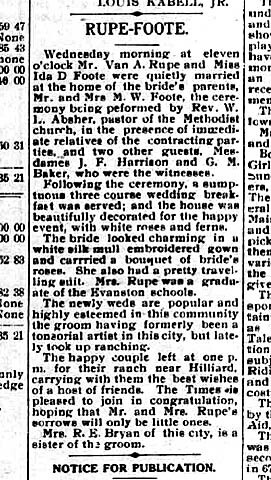 In 1916, she married Van A. Rupe in Evanston. Miss Foote contributed several recipes to the book, but today’s feature is her Amber Marmalade. Shave 1 orange, 1 lemon and 1 grapefruit very thin, rejecting nothing but seeds and core. Measure the fruit and add 3 times the quantity of water. Let stand in an earthen dish over night, and the next morning boil for 10 minutes. Stand another night and second morning add part for part of sugar and fruit. Boil steadily until it jellies. This makes 12 glasses. Are you expecting a crowd for Christmas Dinner? 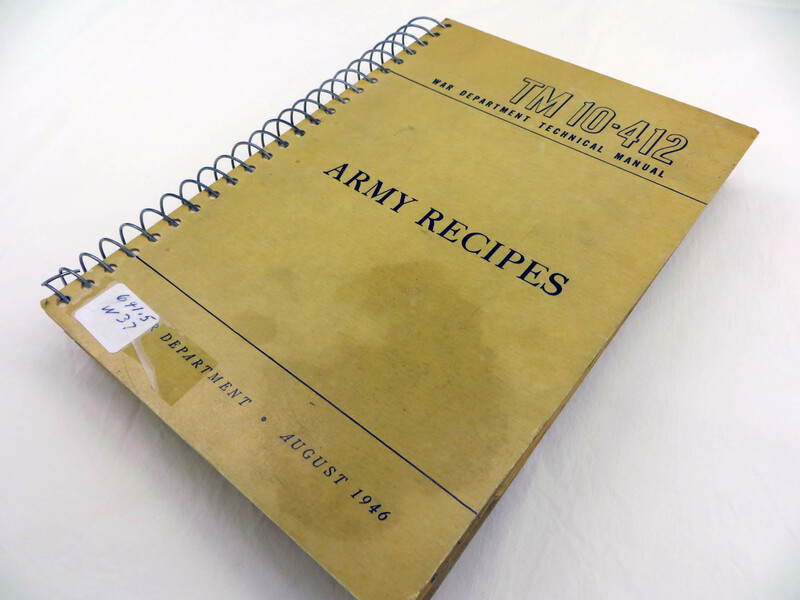 Maybe this recipe for Gingerbread from the US Army’s official recipe book will help. After all, they are experts at feeding a crowd. 1. Stir shortening until soft and smooth. 2. Add sugar gradually; mix throughly. 3. Add unbeaten eggs a few at a time, beating after each addition until well mixed. Beat thoroughly at this stage to insure light, tender cake. 4. Add molasses and beat well. 5. Sift flour, baking powder, soda, salt, ginger, and cinnamon together twice. 6. Add dry ingredients and water alternately to egg and sugar mixture, first adding about 1/3 dry ingredients, then 1/2 water, then another 1/3 dry ingredients and remaining water and dry ingredients. 7. Mix thoroughly but avoid over mixing. 8. Place in greased sheet pans. Bake in moderate oven (350 F) for 30-35 minutes or until done. Note: This recipe makes 2 sheet pans (18 x 26 x 1 inches) or 7 loaf pans (9 7/8 x 4 1/4 x 2 3/4 inches) or 200 individual cakes 3 inches in diameter. Yield: 100 servings, each 3 1/2 x 2 1/3 x 1 1/4 inches. 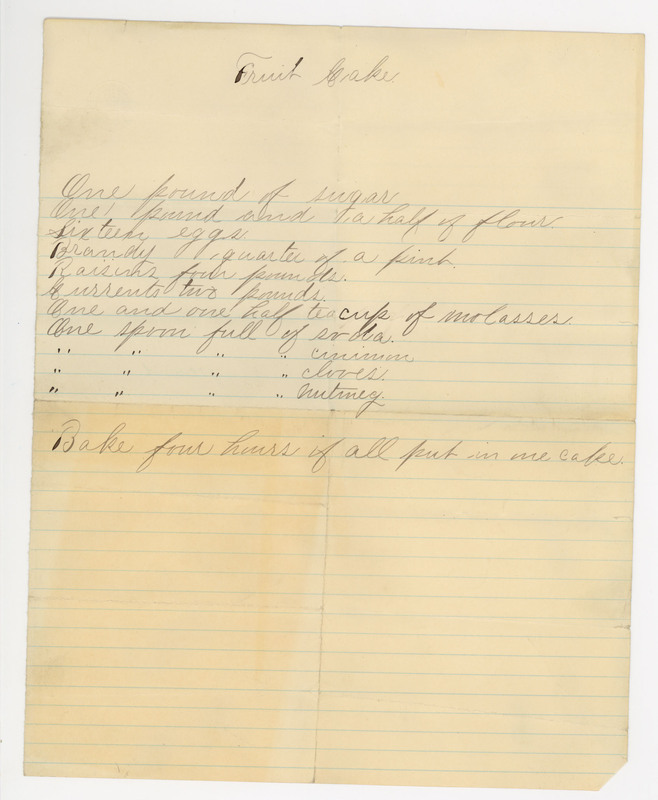 Today’s Friday Foodie recipe comes from the scrapbook of Estelle Reel Meyer, the nation’s first woman elected to public office in the United States (Wyoming’s Superintendent of Public Instruction 1894-1898) and Director of Indian Education for the Bureau of Indian Affairs 1898-1910. Her extensive and eclectic scrapbooks also contain various beauty remedies and exercises, eye wash prescriptions and a recipe for a cholera cure. Bake 4 hours if all put in one cake. 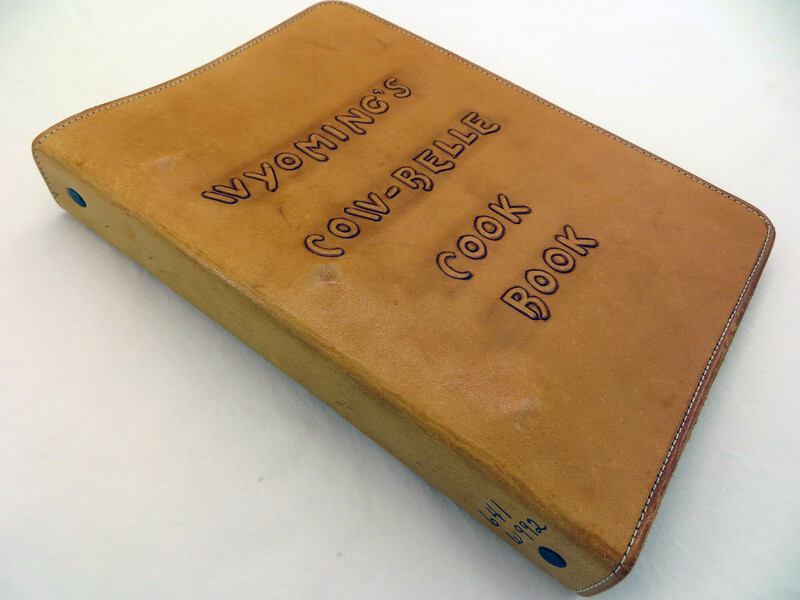 In 1965, First Lady Martha Close Hansen helped to compile a cookbook full of Wyoming family recipes for the 75th anniversary of statehood. This was a special anniversary for Wyoming as there were still many people living who had either seen the original statehood celebration or had heard about it from those who had lived it. Publicity photo for the Cooking in Wyoming cookbook. 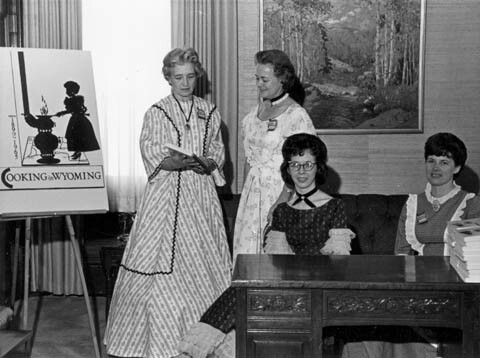 Mrs. Martha Hansen and three ladies all dressed in period dresses in the Historic Governor’s Mansion. The Hansens lived in the house from 1963 to 1967. 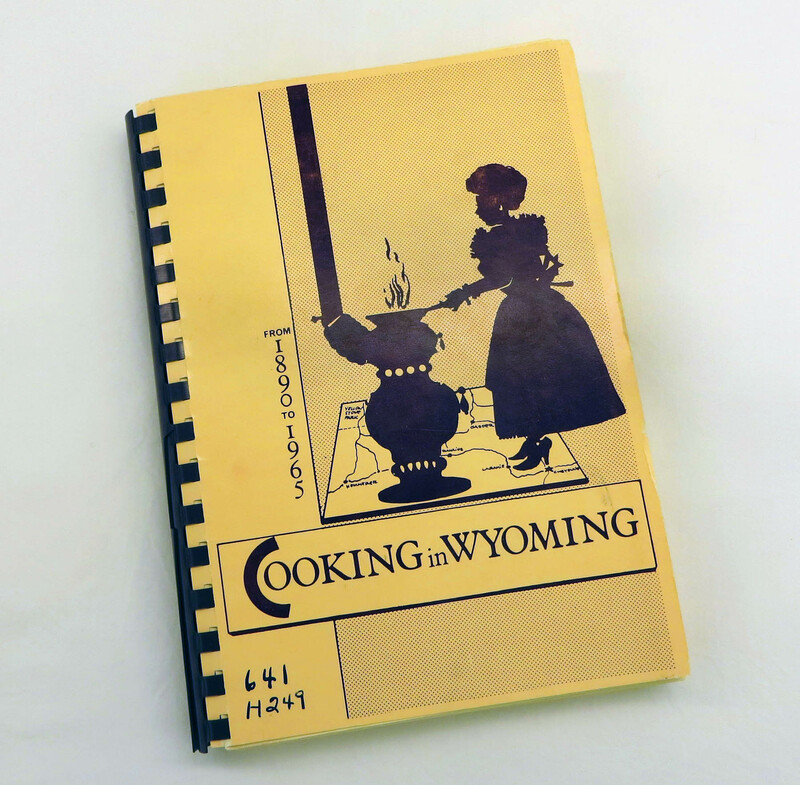 One entire section of the book was dedicated to Wyoming’s first ladies’ recipes and included submissions from Mrs. Robert D. (Julia) Carey, Nellie Tayloe Ross, Mrs. Frank (Jean) Emerson, Mrs. Leslie (Margaret) Miller, Mrs. Nels (Marie) Smith, Mrs. Lester (Emily) Hunt, Mrs. Frank (Alice) Barrett, Mrs. C.J. (Mabel) Rodgers, Mrs. Milward (Lorna) Simpson, Mrs. Joe (Winifred) Hickey, Mrs. Jack (Leona) Gage, and of course Mrs. Cliff (Martha) Hansen. When we first came to the [Governor’s] Mansion, Mrs. Conroy, our housekeeper, said that she would try to cook anything we asked her to, except Hollandaise Sauce. We tried this recipe and she has made it successfully every time. We serve it often with vegetables. Melt butter or margarine in top of double boiler over simmering water; stir in hot water. Remove top from heat and set on work surface. Add unbeaten egg yolk all at once; beat with electric or rotary beater 2-3 minutes, or until mixture is almost double in bulk. Stir in lemon juice, salt and cayenne. Place over simmering water again; cook, stiring constantly, 5 minutes, or until thickened. Cook milk and mayonnaise together in top of double boiler for 5 minutes, stirring constantly. Add lemon juice, salt and pepper; stir. Organized on June 6, 1940 as Wyoming’s Cow-Belles, the original group was headed by Charlotte Snodgrass and consisted of ladies who wanted to do more for the livestock industry. In 1992 our name changed to Wyoming CattleWomen, Inc. to reflect the more professional organization we have become. The primary goal of Wyoming CattleWomen has not changed throughout the years — to maintain and increase the demand for beef and to promote a positive image of our industry. In 1948, the ladies gathered together some of their favorite recipes and published their first cookbook. The recipes include instructions for preparing everything from stew and steak to cakes and pickles. With so many great ones to choose from, today is a two-fer: steak and fried chicken. Put a few shavings of suet [lard] into a frying pan and when very hot put in steak. Sear and turn then fry as usual. Have on a platter a mixture of hot melted butter, salt and pepper in which you put the steak. This process will make a tough steak tender. On a ranch it is nice to have fried chicken quite often, especially when you raise the chicken, but it is quite a job to fry chicken and get the main part of a meal all at the same time, so here is how I do it and it makes the chicken much better besides. I get chickens ready to fry, usually the evening before I need them if I have to have very many. Then the morning I need them I fry them about 9:30, slowly, and just brown each piece. While it is browning, I get out my Dutch Oven, grease the inside. Then when the chicken is brown, I put it in the Dutch Oven, pour a little hot water on it and put it in a slow oven to steam very thoroughly. You have to add water every once in a while but this leaves you free to do other things at the last minute rush. Also you can do the same to any fried foods. You might have to add some salt as it takes quite a bit for steaming. On steaks, instead of adding water, put in a can or two of tomatoes and season.